This is a longer version of an article that originally appeared on ARLnow.com. For most of the week, Birch Thomas goes to her 9-5 job as vice president of finance for a small company in Georgetown. She loves the precision of numbers and balance sheets and is good at what she does, but her day job doesn’t define her. When Birch Thomas is really “on,” she’s out with her camera taking pictures. With no formal training, Birch picked up a camera with artistic intention about three years ago. 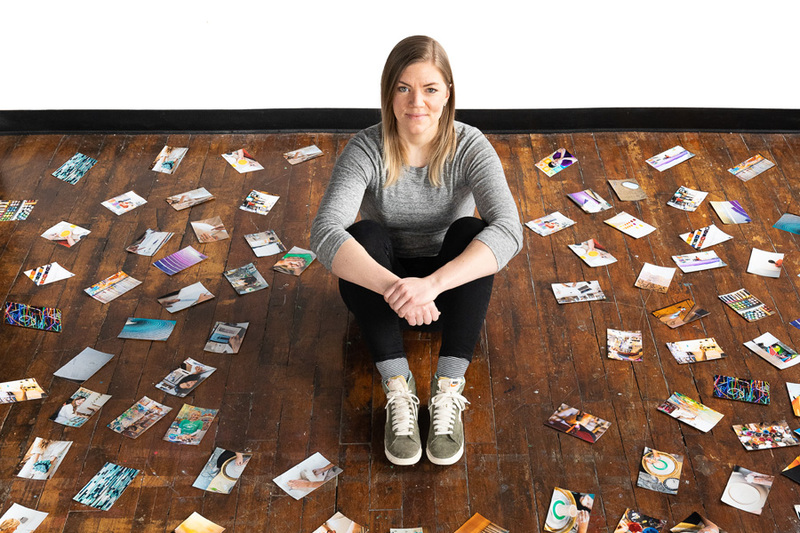 She found that photography brought her joy and satisfaction—a creative outlet for a numbers person who never thought she was creative. Soon, she and her camera were inseparable. In those early days, she'd go for walks, camera in hand, frequently waking up for sunrise. Whether photographing monuments, a patch of wildflowers, a solitary cyclist or a string of D.C. rowhouses, one question played continuously in her mind: "How do I show people a different perspective on something they've seen before? On something they see every day?" Over the past few years, Birch's long photographic walks have evolved into a part-time business. Much of her professional work centers around photographing food, weddings and other important occasions, such as parties and baby showers, but she also still loves taking pictures of D.C. landmarks and pieces of everyday life. On Friday, March 29, Birch had her first solo exhibition at Rosslyn CAFÉ, a four-week series of free community events every Friday evening hosted by the Rosslyn BID. Taking place at the beautiful Bennett Park Art Atrium in Upper Rosslyn, Rosslyn CAFÉ introduces attendees to the work of new local artists each week, offering them the opportunity to purchase art while enjoying food, drinks and a festive atmosphere. Birch will be selling unframed prints at Rosslyn CAFÉ in a variety of sizes, and if she doesn’t have exactly what people want on hand, they can order it at the event. Birch is thoughtful when talking about her work and how she goes about taking photos. Often, she hopes to convey an idea or a message, and she likes pairing words with photos. "I want to create photos that inspire people or create a positive moment in their day," she says. "That's part of why I do what I do." Birch says taking pictures of people is a different process for her than photographing objects and places. Photographing people is more about developing a relationship and sense of trust so that others feel comfortable around her. She likes being a fly on the wall, and is most interested in snapping that candid photo of a bride pausing to take a deep breath, or that image of a newborn baby at home with her parents in those first weeks of life. Currently, she’s in the midst of a documentary project photographing artists in their studios. It’s been an honor to be present with artists as they create, and to see how each person’s creative process is different. She's photographed ceramicists, neon artists, fabric artists and painters, allowing her subjects to dictate the terms of her work. With some artists, she visits the studio for an hour, takes photos and is done. Others are happy to allow her to spend an entire day watching them. "I want my photos to be authentic, so I don't take the artists out of their element or pose them," she says. "I want them to feel able to let their guard down when I'm there." Inhale Exhale by Birch Thomas. When she’s out with her camera by herself, Birch shoots whatever catches her eye. More than anything, she follows her gut. 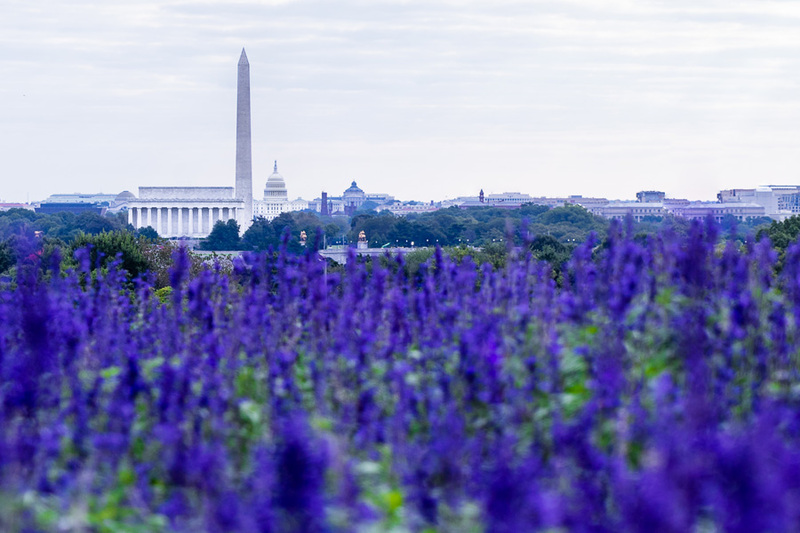 For instance, one Sunday morning out walking in Arlington, she stumbled upon a field of purple flowers with the Washington Monument and Capitol in the background. This is one of her favorite, unexpected photos. Other times, though, she’s deliberate about what she wants to shoot, and will spend months planning and strategizing to take the photo she has in her mind. On another occasion, she came upon two rows of trees forming an arch over a path not far from the Lincoln Memorial. Although near an iconic site, Birch didn't recall seeing these trees represented in photographs. She took several photos of them, but none felt exactly right. She could imagine the photo she wanted to capture, but she knew she hadn't taken it yet. Then, one spring morning after it had been warm enough for buds to start forming on trees, she woke to see snow falling. She jumped up and grabbed her boyfriend, who is also a photographer, saying: "It's snowing! Let's go!" And off they went to the trees near the Lincoln Memorial, where she photographed him walking, a solitary figure framed by budding green branches, the snow coming down and covering the path in front of him. "That's it!" she said. She'd waited five months to create the image she'd hoped for. "I want to create photos that inspire people or create a positive moment in their day. That's part of the reason I do what I do." – Birch Thomas. She's also proud of a picture she took of coins that have just been tossed in the air. She took it at the Lincoln Memorial when she was just starting to get more serious about photography and wanted to challenge herself. With her camera on a tripod, she continually tossed the coins in the air with her left hand while clicking the shutter button with her right. It took her three trips to the Lincoln Memorial to get it right. "A lot of things need to come together to get a beautiful photo," she says. "You can't always pick up your camera and come back with an incredible photograph every time." Birch has spent her whole life in the D.C. area. She's a tenth-generation Arlingtonian who grew up in a creative household—her mom is a pastel artist and photographer and her dad a sculptor. Their talents definitely influenced her interest in photography from a young age. Rain or Shine by Birch Thomas. Her mom attended Moore College of Art in Philadelphia, where she studied photography, but her dad didn't really discover his outlet as a sculptor until about a decade ago. While Birch and her sisters were growing up, he ran the family business, the 40-acre Columbia Gardens Cemetery, located in the Ashton Heights neighborhood of Arlington about a mile from Arlington National Cemetery. Birch's grandparents lived in a house at the front gate of the cemetery and Birch and her parents and sisters lived in a house at the back gate. Ironically, her parents met at a New Year's party in that very house. Her great grandfather founded Columbia Gardens Cemetery in 1917, and it has remained in the family for four generations. Birch is actually her middle name, she says. Her first name is Everett, but her parents called her Birch. She wasn't named after the tree, but rather after her great-great-great-great grandfather, who used to live on a farm in Arlington that was located where the U.S. Marine Corps War Memorial ("Iwo Jima") is now. She likes taking pictures there, remembering that this was once his farm. She's also taken photos from The Observation Deck in Rosslyn and from Arlington House at Arlington National Cemetery, a great spot for capturing the perfect sunset. "I was born and raised in Arlington and now I reside in D.C.," she says. "Photography has allowed me to rediscover places I grew up visiting and gain a greater appreciation for the landscape of my hometown. There's something special about finding an art form that allows you to get lost in a place that is familiar to you." Be sure to come by Rosslyn CAFÉ this Friday, March 29, to meet Birch and see her work firsthand. Check out more of her photography on her website and on Instagram. Photographer Birch Thomas with some of her photos. Photo by Julian Thomas. Photo at top: Push and Pull by Birch Thomas.